Set tonight to a new test of the Lenovo Yoga 920-13IKB in its version “Glass Vibes”. It is also found in a Star Wars version with the same specifications. This convertible ultrabook is hailed for its quality construction, excellent battery life and for its big screen (13.9 inches) supporting the active stylus. Level design, the Lenovo Yoga 920-13IKB borrows many elements from its predecessor, the Yoga 910, among which its guidelines and design. It is installed in the same unibody metal case secured by the same original hinge reminiscent of the mechanism of a watch strap. The latter ensures a fluid cover manipulation from all angles even if the tester would have appreciated a little more resistance. Note that this “Glass Vibes” version as well as the “Star Wars” models are covered with a decorated Gorilla Glass glass lid. 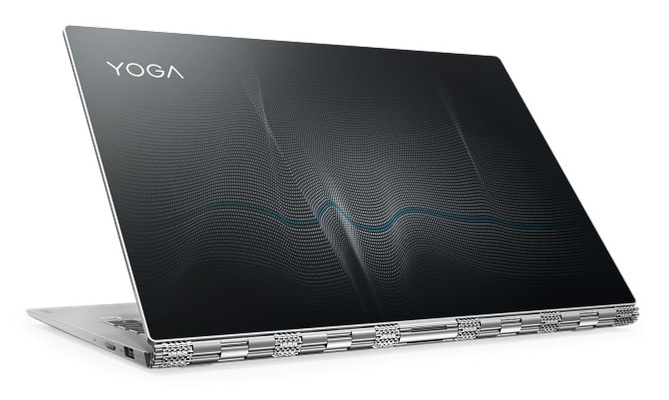 Very thin and robust, the Yoga 920 is also a little more imposing and heavy than its direct competitors (slab of 13.9 “requires), to take into account if you are led to use it more in tablet mode than PC or tent. It is quite limited, consequence of the chassis looking for finesse. However, Lenovo has managed to slip a standard size USB 3.0 port as well as two USB Type-C ports with Thunderbolt 3 support that can be used to charge the device, transfer data, or use adapters (no adapter provided). Entering the bowels of the ultrabook is quite easy, but you will need to unscrew the lower cover held in place by a Torx T10 screw handle. The CPU and RAM are soldered to the motherboard, so the only evolutionary parts are the SSD and the Wi-Fi module. Namely that the SSD is hidden under the motherboard. The keyboard is backlit in two shades and produces a rather quiet typing. The comfort of typing is good even if the tester has had trouble getting used to it, without being able to explain the reason. The stroke is short (1.4 mm) and the feedback is straightforward but something in the key operation disturbed the tester. He therefore recommends to do if possible a test in store before the purchase. As for the touchpad (Synaptics), it is a good size and supports perfectly multi-touch gestures. Similarly, its integrated mouse buttons are pleasant with a short stroke and a responsive and discreet support. The Lenovo Yoga 920-13IKB incorporates a slab of 13.9 inches IPS which presents on the model in test a definition UHD (3840 x 2160 px). This screen has a digitizer that supports the active pen (compatible with the Lenovo Active Pen 2, Bluetooth 4096 levels of pressure sensitivity). The contrast is solid (830: 1) and the bright colors even if the brightness could have done a little better (274 cd / m2 max). With the glossy slab, it will be necessary to remain indoors to be able to read the information correctly on the screen, even in maximum brightness. The colorimetry is satisfactory with the entire sRGB space covered (99%) and a Delta E less than 2. Some configurations are available on the market and the tester has had the most powerful of them. Built around a last generation i7 Kaby Lake Refresh Quad Core i7, 16 GB of RAM and a dedicated 512 GB NVMe SSD, the model tested perfectly handles everyday tasks, with fluidity and a welcome reactivity in Windows. On the other hand, if you plan to tackle photo / video editing, programming or other applications that weigh heavily on the processor, know that its performance is constrained compared to normal. Involved, a limitation of the frequencies of the Turbo by the manufacturer to limit the rise of temperatures in the chassis. Two fans work to dissipate heat and they know how to be discreet. Inactive at rest, they appear from time to time in multitasking or push navigation but it is very quiet. Even in more demanding use, they do not exceed 40-41 dB, which is far from painful. Temperatures are not a problem either with surfaces remaining cool. The Lenovo Yoga 920-13IKB Vibes incorporates a substantial battery of 70 Whr. This is less than the 910-13IKB (78 Whr) but the efficiency of the Kaby Lake Refresh processor compensates. Here, the UHD screen is rather greedy but the autonomy still reaches 6:30 to 7 hours in Internet browsing via Wifi, it is very honorable. It is necessary to wait for versions in Full HD that they hold a few hours more.